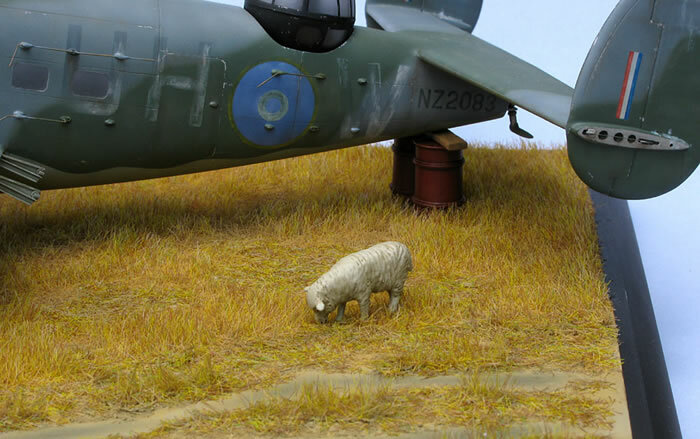 This project was initiated as part of an IPMS Auckland group build of RNZAF aircraft to celebrate the 75th anniversary of our Air Force in 2012. I had already completed an RNZAF Skyhawk earlier in the year but still hadn’t gotten rid of the RNZAF bug – so what to build? I had a half-built Aermacchi MB 339 but without decals it will have to languish in the box for now. I also had an Avenger, Mosquito, Harvard, Dauntless and Shagbat in the stash but I was after something that would be a fairly quick build. The slots in the wing tips would need an interior made to connect the upper and lower surface so how about we just cut off those nasty wings. The resin engines are also a bit rough and the cowls lacklustre – let’s biff those out too. It’s really going to need a fuselage interior but I can’t be bothered so why not just fog up the windows so it can’t be seen. Hey it’s half built before I’ve even started and not only that it’s only half an aeroplane to paint as well. Moreover I have a truckload of walkaround photos I took of the MoTaT Hudson when it was being restored just itching to be used. The decision had been made; the can of worms was opened. At the conclusion of WWII, many of the RNZAFs combat aircraft were put into outdoor storage at Rukuhia near Hamilton. The Lend Lease deal they were acquired under meant that they were owned by the US with the NZ Govt having the option to buy them. With the war now over we didn’t want them. The US didn’t want them either so they had to be sold as scrap with the earnings going back to the US Govt. 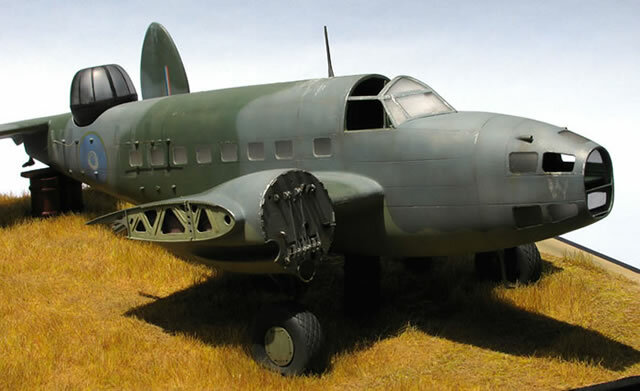 Rukuhia was administered by the RNZAF up until 1948 and the aircraft there maintained by them. Eventually most were auctioned off as scrap some being smelted on site. 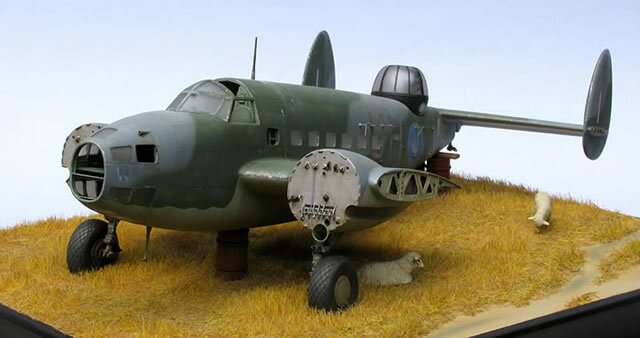 Many aircraft parts were also sold to interested parties such as wheels to use on trailers, canopy escape hatches for greenhouses to grow cabbages under and of course once the RNZAF had left vandals had a good go at them too. First up I got stuck into the wings with a razor saw cutting them off just outside of the engine nacelles. Next I made wheel wells in the bottom wing halves which of course won’t be seen on the completed kit. Then the halves were glued together using the fuselage wing root as a shape guide. Once set they were internally braced before adding scratchbuilt end ribs and interior wing flap ribs and Fowler flap guide rails. I then attacked the cockpit. 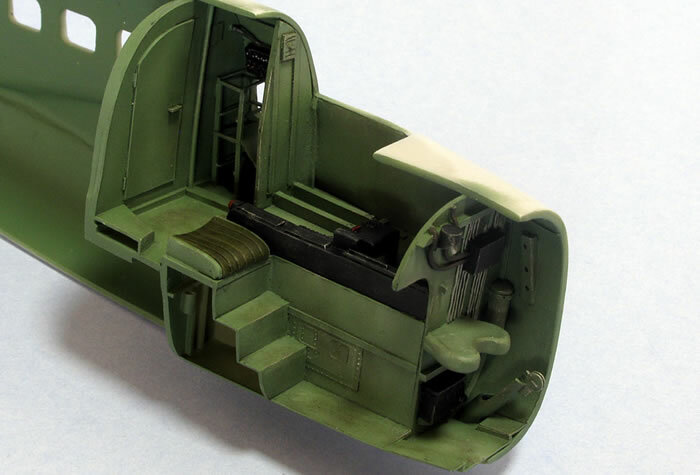 The CA resin was actually quite nice and fitted the interior fuselage shape very well however, getting the cockpit parts glued together was difficult. Much guesswork, dryfitting, trial gluing and then snapping bits off and re-gluing was necessary. Unfortunately there are more things wrong with the cockpit’s accuracy than you can point a stick at. I hacked up the control panel to move some of the instruments around adding decals from the spares box to the faces of some and also making throttle levers from scrap PE. 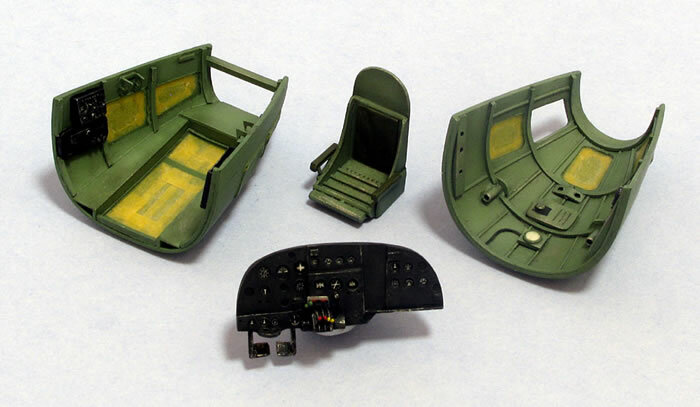 The seats required reshaping and a radio operators compartment was made as there was none in the kit. This is when I discovered that the rear bulkhead of the cockpit should be further back but there was no way to fix it easily so I left it alone. Then I scratchbuilt the stairs leading to the nose and also the entire nose interior. 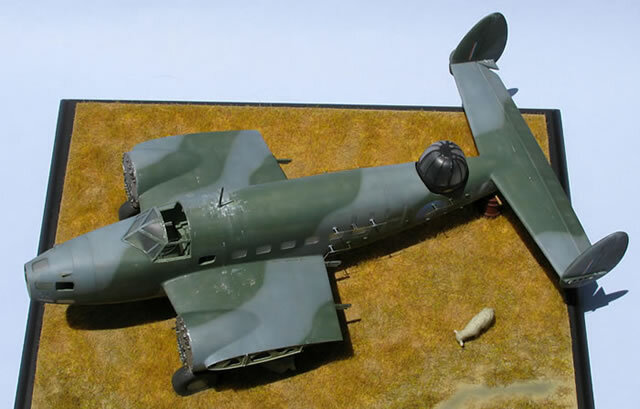 What little CA resin there was supplied for the nose section was highly inaccurate and most of it was replaced. I also cut out a couple of windows and left off the nose glass so the interior could be seen more clearly. The interior was painted Humbrol 78 UK Cockpit Green to match what would have been a US equivalent paint colour. All the ill-fitting windows were glued in place with plastic cement, left to set and then the gaps filled with super glue. Since they would be fogged anyway I just sanded them flush with the fuselage. I decided to leave the bomb doors closed as I already had enough work to do. Photos of Hudsons in the wild at Rukuhia show the bomb doors hanging open so I would have to keep mine closed by jamming a 44gal drum underneath. Next, I scratch built the framework for the gun turret to sit on as the CA instructions would have you glue it to thin air. A proper interior also had to be made for the turret as you would see the shadows when it is complete. I also corrected the tailwheel position and removed the tail fairing to show the underlying structure. I removed the DF loop too as it seems to be missing in most period photos from Rukuhia. The horizontal tailplane needed a bit of reworking especially squaring off the trailing edges where it meets with the rudder. I also dropped the elevator for added interest and removed the left tail plane tip to show the rudder cable. Once I was happy with the dryfitting I glued the fuselage halves together. I then attached the tailplane using my Mk. 1 eyeball to line it up “straight”. There are pretty much no straight lines in this kit so it’s best to look at it from an angle. I now reworked the lower engine nacelles adding most of the internal structure and also tidied up the landing gear legs and painted them. Then the wings were attached to the fuselage making sure to line them up as much as I could with the tailplane. I used some strips of plastic card glued to the wing roots for added strength and ease of positioning. Next I attached the landing gear legs to the bottom of the wing using wire for extra strength – there is nothing to really glue them to except for 2 slight depressions. Now I could finalise the fit out of the lower nacelles. Once I was satisfied with the fit I painted and weathered the nacelle and wheel well interior then glued the lower nacelles in place (as it happens one of them turns out to be oval in cross section). I scratchbuilt the basic firewalls for both engines and glued them to the front of the nacelles. Once set I trimmed them to shape then added all the detail to the front without fear of any breakages. Last on was the clear nose section which actually fitted very well; only a small amount of filler was needed. First order was to mask all those fuselage windows. I cut a strip of Tamiya Tape to the window height and lay it down the length of the fuselage windows. I masked both outside edges of this and then removed the first piece. Now I did the same vertically for each window. This left me with each window framed with tape. All I had to do now was mask the windows themselves using the tape edges as my guide. First I placed the round corners using punched out circles followed by the 4 edges of each and then a piece to mask the centre. Lastly I removed all the surrounding tape to reveal lovely masked windows; a lot of effort but well worth it. 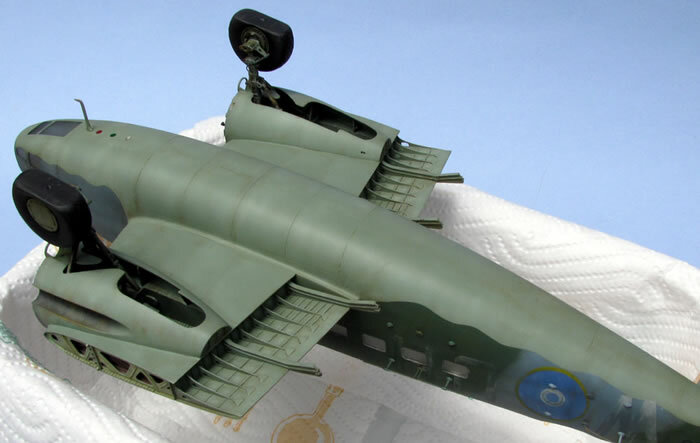 I started by hand painting the wing end ribs in an RAF Sky colour (Tamiya XF21 Sky) as this would have most likely been the approximate original factory colour and probably not subjected to the RNZAF repaint protocol. Next I sprayed the topside camouflage freehand giving each colour some lighter post-shading as a precursor to the heavier weathering yet to come. It can be very difficult to judge when you have done enough as the colours look so different under various lighting conditions. Next I masked and sprayed the lower surface colour. Once satisfied with the initial painting and weathering I masked up the roundels and the lettering. Firstly I sprayed them with an unweathered version of the underlying colour then only oversprayed what colours I needed to get the worn-off look. A bit of drybrushing completed the illusion. Next I sprayed the engine firewalls aluminium and “greased” them up a bit using several washes of oil paint. Lastly I added the serial numbers made using pieces cut from various decal sheets. After a coat of satin varnish the model was given an overall wash with Windsor & Newton Artisan water mixable raw umber oil paint mixed in Bars Bugs car window washer detergent. Some panel lines were darkened with further washes with black added. Oil stains were drybrushed and some paint chipping applied with a fine brush using Tamiya XF16 Flat Aluminium. I also grubbied-up the exterior using some of the Tamiya Weathering Master sets which I was using for the first time. They seem to be quite good although a finer applicator would be useful. I didn’t bother doing too much on the undersides as they are mostly unseen. A matt varnish was then sprayed to finish the job. The breakable bits were now added. Firstly the Yagi radar ASV antennae on the fuselage. 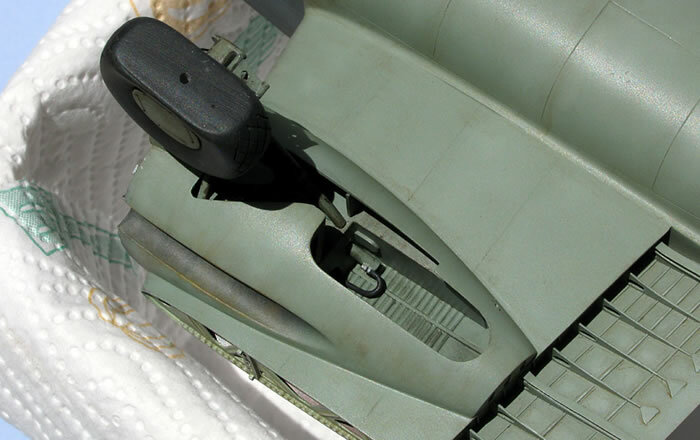 The fairings where they attach to the fuselage were made by heating the end of a piece of sprue over a candle and pressing it into an Eduard PE set that had the airfoil shapes along its edge. Note: the PE with the airfoil shapes is pretty poor for doing this as the plastic expands on the other side of the hole thus welding itself to the PE. Removing the sprue almost destroys the PE! The aerials were first thinned out to be more in scale before they were attached and the tailwheel leg glued in position sans wheel. Next the canopy was glued in place with its escape hatch removed as is commonly seen in period photos. A Final touch with some white oil paint to mimic bird poo and Bob’s your uncle. The diorama is basically a model railroad grass mat glued to a piece of MDF and then hacked up using my electric shaver to make it look more realistic. All I had to do was add some 44 gal drums – two to prop up the tail and one to keep the bomb doors closed. Some sheep were then enlisted to give it a distinctly Kiwi feel. 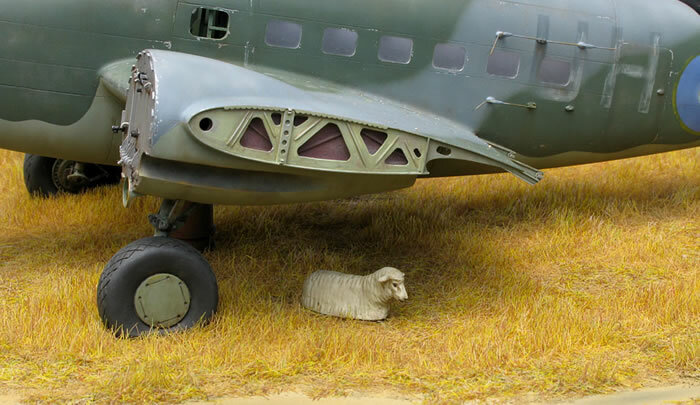 The cast metal sheep were a bit rough but a couple of coats of super glue evened out the surface. So it looks like a decent model can be made from the CA Hudson after all even if you do throw half of it away. Not the fast build I was after but once I got involved it was a fight worth winning. There are just so many flaws in this kit, including several I accidentally introduced, that it would be a mission and a half to fix them all. CA gives you the basic shell and it’s up to the builder to make a decent job of it. 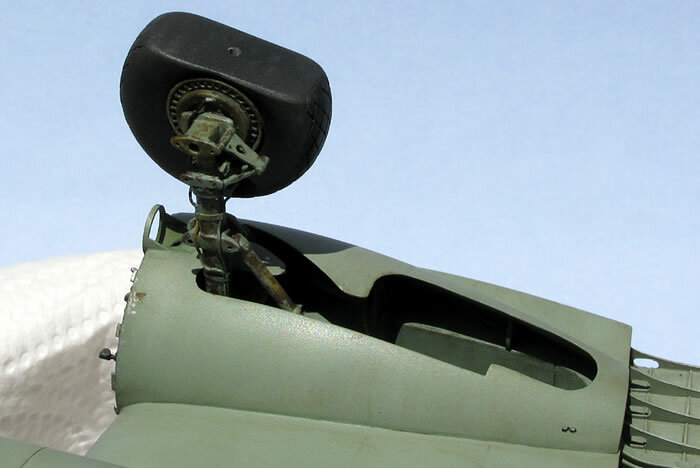 Having said that “wrecking” an aircraft can solve all manner of kit problems from lost or broken bits to lack of decals and ruined canopies. 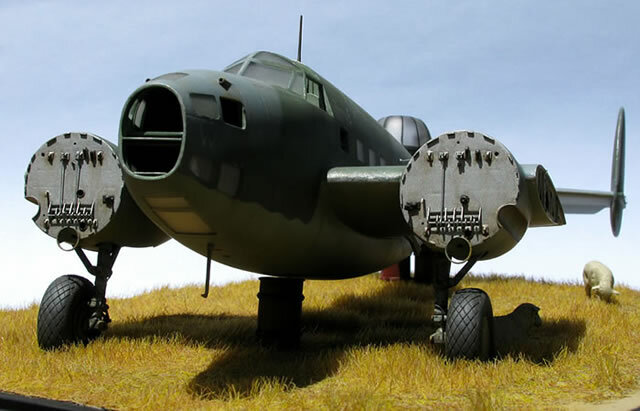 I can highly recommend the challenge of building an abandoned, derelict or wrecked aircraft for your next group build.